Notes to Excel Software convert Lotus Notes Address Book to MS Excel file. It exports all contacts stored in Names.nsf file along with its credentials. The tool maintains no loss of info and ingenuity of the data after conversion. The Software scans the contacts found in Names.nsf file of IBM Notes. As the scan process ends, it listed all the Notes Contacts in alphabetic order which benefits user to find out any specific contact conveniently. As user adds Lotus Notes Contacts file, it automatically get scanned by the Software. And after completion of scanning the tool immediately create preview of each contacts together with its linked fields in detail. The Tool export Lotus Notes contacts to Excel along with its details like Personal, Business, Advance and Briefcase. It creates CSV file after conversion which can be further imported to other Email Clients to view the Contacts. After the completion of the conversion process, the Converter automatically saves the Excel file at the location of Names. NSF file via which it is not required to provide any particular location to save the created XLS file. Lotus Notes to Excel Converter is a windows based tool which is compatible with windows 8.1and all its prior versions. Its simple internal algorithm facilitates user to understand and execute it without any technical skills. Is the installation of IBM Notes mandatory to use this Software? Yes, Lotus Notes should be properly installed and configured for the execution of the Software. And Notes must be disconnected from Domino server at the time of conversion process. Can I export entire contacts of Lotus Notes to Excel at once? Yes with the aid of Software you can export any number of Lotus Notes contacts to XLS file format at once. Can you differentiate Business and Enterprise license of the Software? Business License of the Software aids the single user as well as organizations to work on several machines in the same building while Enterprise License can also be used on multiple machines in a different location. Does this Software support Encrypted or Password protected NSF files? Yes, Software can export contacts from encrypted/password protected Notes file to MS Excel even if the password is not available. Can I execute this tool on different Operating System except windows? No, Notes to Excel is a Windows based tool which can install and execute on windows 8.1 and all its prior versions. 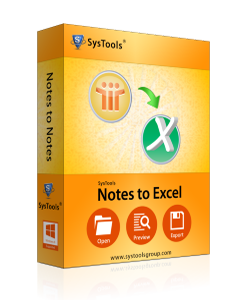 Intuitive interface and very reasonable cost make Notes to Excel Software the product I am very happy to recommend. Your responsiveness to technical questions is simply outstanding. I recommend this tool to my friend because of its simple GUI which can be understood and implement by a Non- technical savvy to convert its Lotus contacts to Excel format easily. Outstanding efforts of the development team of this Software which can easily export innumerable Lotus Notes contacts to MS Excel format without any loss of details.